Taking screenshots is common for those of us who live on our phones and laptops. Sometimes we want to share glimpses of funny conversations with friends, other times, in the office for example, we take screenshots to quickly share unexpected results on our screens. Screenshots are so common that nowadays the majority of our devices offer a specific key combination to either take a screenshots of the entire desktop or allow the selection of a portion of it: The device captures the screen right away and usually save a photo for later use. If this is not enough, there are also plenty of third-party apps and websites offering the same functions. The great CloudApp allows for screen recordings to make animated gifs as well as taking regular screenshots. Thinking about my job at Filestack, I often press Shift-Command-4 on the Mac to take screenshots of the apps views that I want to add in the articles. Moreover, a screenshot is a fast way to show some unexpected logs to coworkers with a simple copy-and-paste in Slack. So, taking screenshots is a manual operation and more or less all the third-party solutions require the user to actively click on buttons or select a portion of the screen. Filestack’s Image Processing API goes beyond that to gives you the chance to programmatically take URL screenshots and set a few options to customize the API behavior. Let’s see it in action with React! The app I built is very easy, it’s just a React app with a single view where users can input the website URL and see it. In addition users can also choose between the desktop and mobile version. As always you can find the sample code on my github. urlscreenshot=agent:desktop or mobile: Determines whether URL Screenshot captures the desktop or mobile version of the specified website. 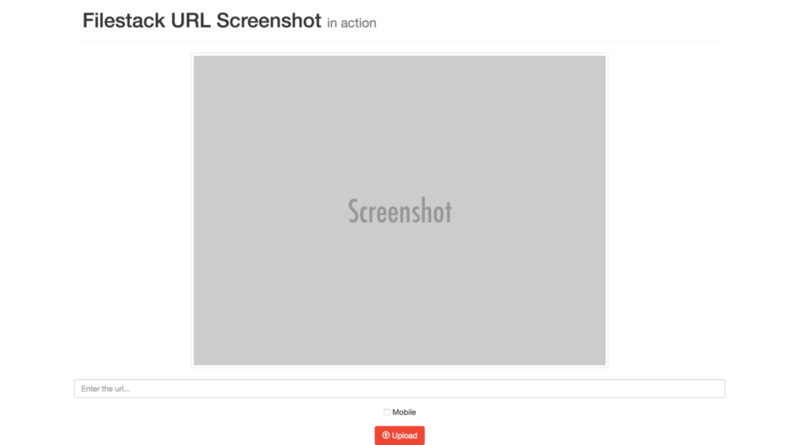 urlscreenshot=mode:all or window: Specify the portion of the website you wish to capture. mode:window will capture only the part of the site visible in the window. mode:all will capture the entire page. urlscreenshot=width:1 to 1920: Designate the width of the browser window. The width is 1024 by default, but can be set to anywhere between 1 to 1920.
urlscreenshot=height:1 to 1080: Designate the height of the browser window. The height is 768 by default, but can be set to anywhere between 1 to 1080.
urlscreenshot=delay=3000 (time in milliseconds): Tell URL Screenshot to wait x milliseconds before capturing the webpage.